The faculty of Engineering is pleased to announce “the Engineering Scientific Day” for the academic year 2017-2018. This is held on Tuesday 24/4/2018 at 12 p.m. in the faculty of Engineering. 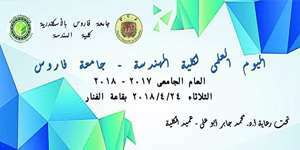 The day is held under the auspices of Prof. Mohamed Gaber Abou Ali, the Dean of the faculty of Engineering. Invitations are open.